A reader might think when reading my title to this blog that this person ...not only doesn't know what she's going to write, and she's just posting to be posting something on her blog. You're right. hahahaha. That's Not It! Not today, maybe tomorrow. (I shortened the story with a comment to Larin, and left a link above...really too stupid!!! My grown children, maybe not all, will understand the...That's Not It! But, Turkey, is the country Turkey. And that's the answer! It would be way, way too weird to try to tell that story and it does happen to be, "Pillow Talk." I guess, honestly, "Amazing Life," should be my title. My blog can't recreate the junk that happens to me in my freaky, 24 hours. I just started an exercise swimming class, rough start with all the activities, but I was signed-up for 3-days a week. Third day, Dave, the instructor gave me a hernia. No, it's not catching...well it is if you' re stupid enough to put heavy weights on your legs and do a kick high enough to hit your nose. (It's hot water, 90-94 degrees, for limberness) I look like I'm pregnant with a belly-button-outie on my lopsided stomach. Small but super uglee and I'm not posting a picture of it. I took a shower and wanted to wear my shower cap, because my hair looked so incredible already. So, I put on the shower cap on and realized when I had it on... I had just glimpsed something that didn't look quite right... inside. You, know those moments, and usually whatever you glimpsed, was really something. I tore the shower cap off my head. "ITS ALIVE, IT'S ALIVE!!" The biggest, ugliest beetle was in my shower cap. 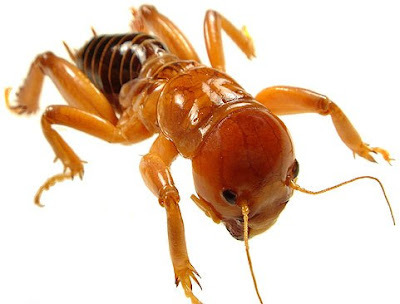 I am so thankful it wasn't a Potato Bug or Jerusalem Cricket. It actually serves me right, because I took a dead Potato Bug and traded it for Baby Jesus in my Nativity during Christmas so the grandchildren would quit playing with the Baby Jesus and losing it. Don't you wish I was your grandma? My hair got really wet in the shower and I went off to the Doctor's office looking like the "Sea Hag," with red lipstick. What a lovely picture, huh? Steve picked me up and we met Kiely at the movies. It had to be another cartoon movie with Steve and Kiely. 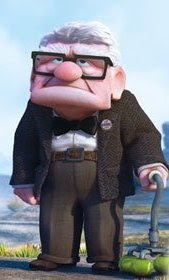 The last movie was on our anniversary trip and titled "Up." The old man looked EXACTLY like Steve's dad. Straight across smile, same glasses, bow tie, clothes, stubble on his chin, and his large, fat, flat fingers. Steve cried the whole movie. Great. This picture shows Grandpa Doug pondering and wishing for french fries and chocolate shake, his favorite treat! He must get those in Heaven. BTW Larin just brought me a mini Wendy's Shake, while I'm looking at Doug's picture. 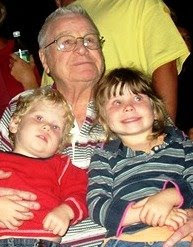 Grandpa Doug, Dallin and Adree, great-grandchildren all watching "Up" fireworks at Disneyland. 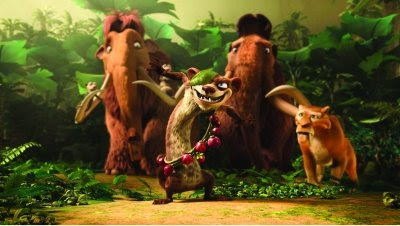 The movie was "Ice Age" and I thought it was tame enough for my dear husband. Maybe he was going to think he was too old and about to become extinct. Crying again...I thought of all the possibilities. The movie concession area made me my own popcorn, with no salt--they are so good to me. 3-D glasses on--- and I'm ready to launch. Not to the Ice Age. But I was so car-sick from the 3-D, I spent most of the time looking for medicine in my purse and trying to figure out if Kiely and Steve would mind if I "hurled" in their popcorn container. I could hear Kiely and Steve laughing at the movie. Clueless--- that I was going to barf . I couldn't tell them or that would make me actually do it. The only part of the movie I enjoyed was the breathing exercise for Lamaze. The big momma Mammoth was birthing. My prayers were answered! My answer to car-sick...start breathing, "Wooo Wooo Haaaa, Woooo Woooo Haaaa." (I think that's in Finding Nemo, too) I was breathing like I was in labor. The looks from the people around me..I could read their minds: "Tourette Woman" "Very Old Pregnant Woman (with an outie)" "I felt the Mammoth's pain in my heart" or "Those two people are that woman's care-givers" I would have done a tap-dance on the stage if I knew that it would keep me from throwing-up. I hate car-sick. Movie over and I left knowing all the dinosaurs and mammals loved each other. That's a wimpy cop-out. My Uncle Terry was here visiting my mom (she lives nest next door, well...it's like a nest, I was raised there) from Hurricane, Utah. He says Hurricane like it was in Florida. Yes, he's newly planted, but he thought we wouldn't know the real lingo. Duh! Half the Elders that come to our ward for missions, are from either "Herrakin, "or "Burley, Idaho." I reserved myself and didn't call him a Utard. I'm really, really so glad he came. We have the same heart defect and he shared his ideas. The best part is that he had some names on lines that I didn't have and I was stuck, BECAUSE...the names were spelled wrong! And pronounced wrong, by me. And I was making fun of his pronunciation of his town. I mixed-up trivial with real important stuff. I'm still loving genealogy and I think our whole family does. They aren't members of The Church, but they will be. Last evening....I got burial sites, locations, half-brother to my grandpa... and where he was. I so loved it. We talked outside in the gazebo until we couldn't see each other and the mosquitoes did. I couldn't eat dinner, but did eat very late--about 10:30. That's when I became nuts. What did I eat? I did have mushrooms on my shish-ga-bob, but the mushrooms were from Ventura. Steve and I waited for Kiely to come home from FHE at the Singles Ward. Kiely told us there was this white horse and a handsome prince, and we got concerned. I honestly didn't know I was so tired, really tired. I thought we would stay awake and talk to each other. "Pillow-Talk," We needed that. 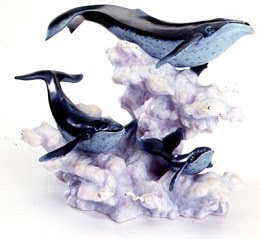 I would start to say something back to him making complete sense and right in the middle of my sentence say, "Whales are swimming in the sky." Steve would say "WHAT?" "Me?" "Wad' I say?" It was like I was on drugs, but I guess I was just tired...but, I only sleep with my MP3 sleepy music. "I'm awake, I'm awake!" Steve egged me on with the conversation. I'd start talking normal and then, "WACKO!" Steve told me finally.... instead of talking, I would start a sentence and then in the middle... start doing my "sleep breathing." I awoke early to the sound of Banana, our donkey. I'm beginning to love her loud, "AWAKE! YOU BLESSED HUMANS! The sun is going to jump-up over the mountain! I think I'm going swimming today. No leg lifts, no weights and start slow. Yes, I will. The sun hit my face and I rubbed my eyes. My eyes were filled with "sleepers" (eye sand?) I mean the whole socket. Was I sad? Oh yeah, I forgot there were these large creepy beetles crawling out of my hair and it was in living color. I shouldn't go to 3-D cartoons or catch bugs with my shower cap. ****I sorta' watched the movie, and not one time, did I think that Larin looks like an 'Wooly Mammoth' Oh, no! Pregnant for...isn't almost 2 years? I just got corrected by THE animal science major, Kiely. It's 22 months for elephants, probably the same for Mammoths. Yes, Kiely.... I think all of mine where almost that long. I don't get it!.......Really!!! Randomness for sure. I feel like I have already been pg for 22 months. Sorry about your hernia. I wondered what you meant on facebook. gross bug in the shower cap! 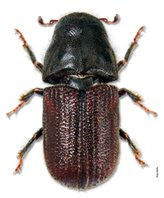 IT WAS A BARK BEETLE-PICTURE DOES'T SHOW THE ANTENNA, AND IT HISSES AAACCCKKK!